2. The Medical Physical test and events for the posts under Forest Department will be common for posts in same Department (FRO,FSO) and will be held from 04-05-2018. 4. The candidate who are admitted for the verification of Certificates are required to produce the Original Certificates along with one set of Photostat copies duly attested by Gazetted Officer, relating to Age, Qualifications Community (Integrated) , Latest Creamy Layer exemption certificate in case of B.Cs as per Memo No.3009/BCW/OP/2009, Government of Telangana, Backward Classes Welfare (OP) Department, Dt:18/12/2015 (prescribed format hosted on Commission’s website), Certificates relating to claim of age relaxation, Study (from 4th class to 10th class), basic information data (Check List(1set), attestation forms (2 sets) and if any, at the time of verification of documents, failing which, they will not be admitted in subsequent process of selection. No request will be entertained for subsequent submission of any of the above certificates. In terms of the notification, the candidates should possess the requisite qualifications as on date of notification i.e. 15-08-2017. 5. The dates for verification of certificates will be announced later. Meanwhile the candidates are requested to obtain and keep ready all the certificates as mentioned in the Notification. 7. The day wise Schedule for Physical Test and Events will be hosted on the Commission’s website. 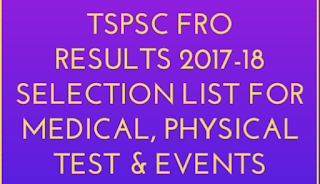 ➤Download List Of FRO 2017-18 Hall Ticket Numbers Who Provisionally Selected/admitted to Medical, Physical Test and Events. 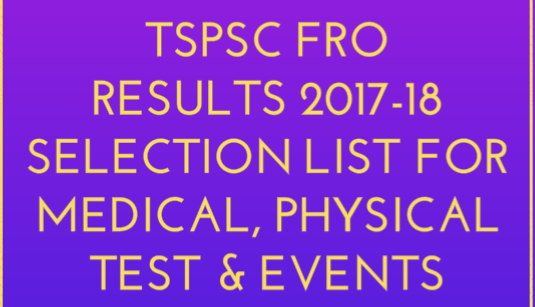 Download List Of Hall Tickets Who Provisionally Selected to Medical, Physical Test and Events.